The I-5/La Novia project is the first roundabout on the state highway system in Orange County. The modern and sustainable roundabout design improved the flow of traffic through what was an awkward offset, four-way stop intersection. The project was completed on time and under budget. The roundabout was designed to address both existing and forecasted operational deficiencies to improve traffic direction and ease congestion at the intersection to accommodate future growth. The design of the four-legged roundabout included an inscribed circle diameter of 150 feet, a landscaped central island, a traversable truck apron, single lane approaches, and raised splitter islands. Michael Baker International collaborated with a diverse team of project stakeholders, including Caltrans District 12 and Headquarters, the City of San Juan Capistrano, the Federal Highway Administration (FHWA), Pacific Point Development, as well as local businesses and surrounding residential communities for the duration of the project. For nearly 20 years, the awkward, offset I-5 freeway off-ramp intersection in the City of San Juan Capistrano was the subject of many alternative improvement concepts, none of which had been realized. The existing stop-sign controlled intersection was regularly congested and created confusion among commuters, leading to higher than normal traffic incidents. Michael Baker International developed an approach, in partnership with the City and Caltrans, to improve existing operations and accommodate future local and regional growth with a modern roundabout design. In addition to being the first roundabout on the state highway system in Orange County, it was also the first to be formally analyzed and approved through Caltrans’ Intersection Control Evaluation (ICE) process, setting the foundation for future roundabout intersections in the county. The project is unique because it was designed to fit the existing topography, which was constrained by a steep hillside landform to the east of the I-5 and the close proximity of Valle Road to the I-5, which made for a very tight work area in which to improve the intersection. The public engagement efforts were also an integral part of the project and helped to overcome initial concerns to gain and maintain the invaluable trust of the public for the duration of the project. The project has resulted in improvements to safety, air quality and community aesthetics. Roundabout intersection design has a documented history of reducing the severity of collisions by lowering speeds at intersection approaches and in the intersection itself. The number of vehicle-to-pedestrian collisions at the La Novia intersection reduced from 24 points, with a signalized intersection, to 8 points with the modern roundabout; a 67 percent total reduction. The I-5/La Novia roundabout project addressed many challenges associated with the physical location of the project. The existing interchange intersection geometry was constrained by the steep hillside landform to the east of I-5. One leg of the intersection, La Novia Avenue, descends from this hillside at an 11 percent grade. This existing constraint, along with the close proximity of Valle Road to I-5 resulted in a very small area in which to improve the intersection. Improvements included the realignment of the northbound I-5 exit and entrance ramps, Valle Road, and La Novia Avenue to eliminate the existing offset intersection and congestion. One of the most challenging aspects of the project was determining how to stage the construction of the roundabout while keeping the intersection open to traffic. Michael Baker International prepared an eight-stage construction staging/traffic handling plan to address the complexities of the work sequence. The plan and execution by the contractor were so successful that the intersection operated more efficiently during construction than prior to construction. This phase of the project was facilitated and communicated through updates on the City’s website, which included information and graphics of construction stages and detours. During the environmental review phase, the project team needed to address questions and concerns from the community regarding roundabout operations and safety. Community concerns were based primarily on negative individual experiences with poorly designed “traffic circles”. These concerns were further compounded by the fact that this would be the first test of an unproven form of intersection control in the city. To address these concerns, Michael Baker International prepared detailed traffic flow simulations, procured video footage from a similar Caltrans roundabout in northern California, met individually with City Council members to explain the project, conducted three public information meetings, and presented the project at two Planning Commission Meetings and two City Council Meetings. These public engagement initiatives played a key role in educating the public and lawmakers to help alleviate concerns regarding the project. Support from FHWA and Caltrans Headquarters, and their roundabout experience from other cities throughout the country, also proved invaluable in the effort to gain and maintain public trust and support. The roundabout was officially opened to traffic in April 2017. 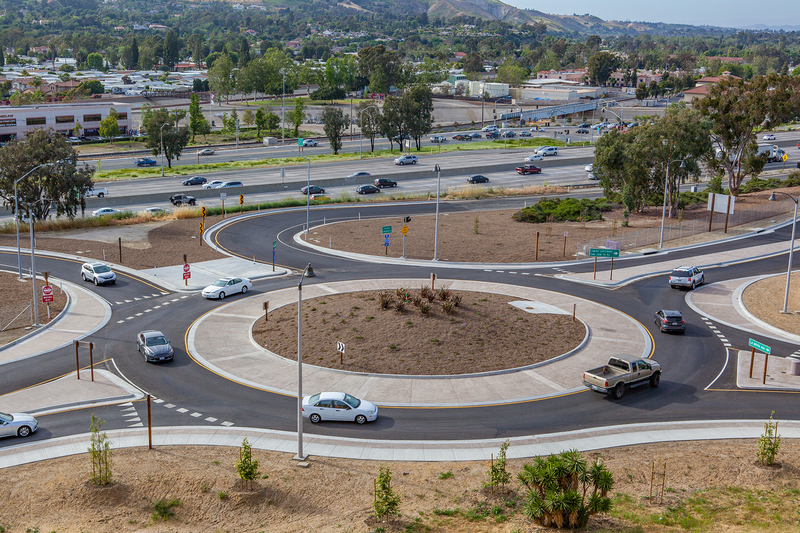 City management, Caltrans and the community at large recognized the benefits of the new roundabout in significantly improving traffic operations at the intersection. This recognition helps to advance a positive image of engineering innovation and excellence. The project received the 2017 APWA Southern California chapter B.E.S.T. award and the ACEC California Engineering Excellence Honor Award for 2018. The I-5/La Novia project is the first roundabout on the state highway system in Orange County. The sustainable roundabout design improved the flow of traffic through what was an awkward offset, four-way stop intersection. The project was completed on time and under budget through collaboration between the City, Michael Baker International, Caltrans, FHWA, and the local community. The new roundabout eliminated operational deficiencies and will accommodate future local and regional growth. The I-5/La Novia project is the first roundabout on the state highway system in Orange County. It was the first project to be formally analyzed and approved through the Intersection Control Evaluation (ICE) process in District 12. The I-5/La Novia roundabout ICE documentation prepared by Michael Baker International has been used by Caltrans Headquarters as an example for subsequent ICE processes conducted across the state. Through an extensive and collaborative process with numerous project stakeholders, a roundabout intersection was determined to have the highest benefit-to-cost ratio, the least amount of right-of-way, most efficient operation, lowest cost to construct and maintain, and superior safety attributes compared to signalized intersections. The roundabout intersection has improved existing operations, enhanced vehicular and pedestrian safety, and is projected to efficiently accommodate future traffic volume increases. In addition to the traffic operation and flow benefits that have been realized by replacing the offset stop-controlled intersection with a modern roundabout, the project has resulted in improvements in safety, air quality and community aesthetics. Roundabout intersection design has a documented history of reducing the severity of collisions by lowering speeds at intersection approaches and in the intersection itself. The number of vehicle-to-pedestrian collisions at the La Novia intersection reduced from 24 points, with a signalized intersection, to 8 points with the modern roundabout; a 67 percent total reduction. The roundabout was officially opened to traffic in April 2017. City management, Caltrans and the community at large recognized the benefits of the new roundabout to significantly improve traffic operations at the intersection. This recognition helps to advance a positive image of engineering innovation and excellence. The project received the 2017 APWA Southern California chapter B.E.S.T. award and the ACEC California Engineering Excellence Honor Award for 2018.